With the advent of the Internet of Things and Industry 4.0, the manufacturing sector can benefit greatly by analyzing data at a real time to find growth in unexpected opportunities. Industries can capture new growth through three approaches- boosting revenues through an increase in production and creating hybrid models, using data analytics combined with intelligent technologies to transform the workforce. 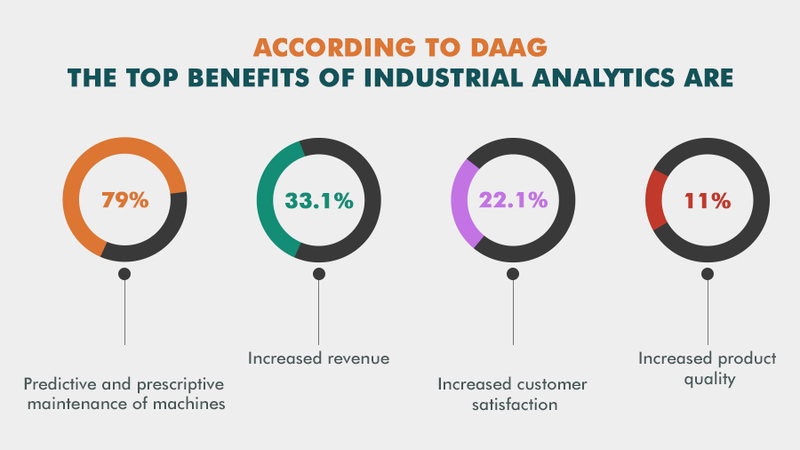 Industrial Analytics is the collection, analysis, and usage of data generated in industrial operations and throughout the entire product life-cycle, for companies that are manufacturing and selling products. It is done by traditional methods of data capture and statistical modeling. However, in the future, this will be enabled by up-gradation in connectivity through the Internet of Things and better and faster methods for analyzing and interpreting data using Machine Learning. It is predicted that Business Intelligence (BI) tools, Predictive Analytics tools, and Advanced Analytics will increase in importance to industrial manufacturing leaders from 39% to 77% in the next five years. The Industrial Internet of Things is the use of Internet of Things (IoT) in manufacturing. It consists of a network of a multitude of devices connected by communications technologies, through which it can monitor, collect, exchange, analyze data and then delivers valuable new insights. It incorporates machine learning and big data technology, machine-to-machine communications, and automation technologies. Industrial Internet of Things (IIoT) and Industry 4.0 will enable an era of edge machines that can make autonomous decisions and trade-offs regarding manufacturing execution. Analytics will lead communication within production environments where machines would make decisions at the real-time, learn from those decisions and improve performance over time. The Industrial Internet of Things provides a significant transformation potential in the industrial sector. Moreover, the Deutsche bank also estimated that IIoT will help manufacturers to increase their productivity by 30%. To stay competitive, industry and its leaders need to understand the potential impact of IIoT and the risk of moving slower than the competitors already implementing IoT. By reducing unplanned downtime and increasing operational efficiency, which is achieved by analyzing data from the machines and operators in real-time through sensors and devices IoT is making manufacturing smart. Currently, most industries have a reactionary approach where they seek to fix the equipment after it fails. With the power of IIoT, and putting sensors in manufacturing equipment, it is possible to predict the health of the equipment, predict its failure. This gives industries an opportunity to fix small problems before the bigger one rises. Recently, KONE a global leader in the elevator and escalator industry partnered with IBM to transform KONE’s operations and technology capabilities around the world. KONE’s newly launched 24/7 Connected services use the Watson IoT Platform whereby connecting their elevators to the cloud, listening and analyzing messages, they can tailor the perfect maintenance to each individual elevator. ThingWorx is the most comprehensive IIoT-specific platform that provides built-in analytics to analyze big data, then translate it into real-time, contextualized understanding, without the need for data expertise. We helped one of our clients integrate ThingWorx in their system to minimize risk in machine operation, making machines learn from the past, anticipate the future, and deliver greater value to their clients. Predix is another big operating system for the Industrial Internet, purpose-built for the digital industrial era. It captures and analyzes the unique volume, velocity, and variety of machine data in a secure, industrial-strength cloud environment. So you can tap into your data and apply it to gain valuable insights and achieve new levels of business performance. It is estimated that manufacturing companies worldwide will spend $500 billion a year on IIoT Technology. Further, the value generated by IIoT will reach $15 Trillion per year by 2030. We are recognized as a top Internet of Things Companies on DesignRush. Get in touch with us to know how IoT can make your business process smarter and answer some of your challenges.